We all appreciate a hot, savory meal—especially one that comes to us fresh from an open fire deck oven. That’s why so many people turn to FIREBREW Bar & Grill when they are looking for an incredible Virginia Beach restaurant experience. If you’re someone who loves to pair a good meal with an alcoholic beverage, you probably already know what you’re doing. However, many people are new to the world of pairing their alcohol with their food, so we are here to help. 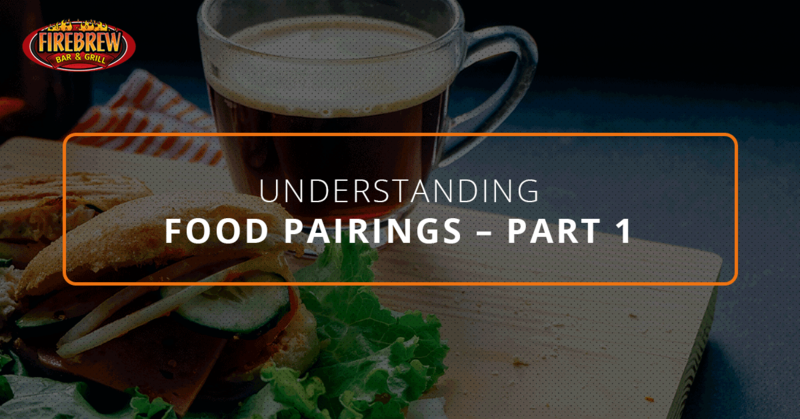 In this blog series, we are going to share the top pairing suggestions we have. To be honest, we find that the right drink can completely make your dining experience complete. On the flip side, choosing a beverage that doesn’t go with what you have chosen to eat could possibly even ruin the meal. You might not see that as being the case, but imagine that your drink is just another component of the meal. For example, you might pair your chicken dish you prepared with some broccoli on the side. You might also add some cheese on top of both. Sounds good all together, right? Now imagine pouring some chocolate syrup all over the meal. For most people, this would ruin it entirely. Your alcohol choice has the exact same power, which is why it has become so popular to explore what beers, wines, and cocktails match the foods on your plate. Obviously there are a few items that pair quite naturally, such as red wine and steak or white wine and seafood, but there is a big, wide world of food pairing that has yet to be explored. Read on to learn more! Oysters are naturally salty, so we have found that the light and subtly-sweet taste of champagne in combination with the bubbles creates a great balance. Try this combination at your next party, or splurge on your next date night! This is one of our favorite pairings, especially with all the incredible fish dishes we offer. Fish, much like other types of seafood, is a very delicate flavor. With that in mind, you should always choose to drink something that won’t overpower the flavor of the fish. We have found that white wine is the perfect choice for these sorts of dishes, as the gentle flavor doesn’t overwhelm the soft flavor of the fish. White wine is also a common ingredient in dishes that involve seafood and pasta combinations! Check back soon for part two of this blog, where we will cover even more fascinating and delicious food and alcohol pairings you can try right in our restaurant! If you are ready for a Virginia Beach dining experience like never before, it’s time to visit FIREBREW Bar & Grill. We look forward to seeing you and the family tonight for dinner, or bring your friends in for happy hour. Regardless of when you stop in, you’ll enjoy food made freshly for you in our open fire deck oven! We will see you and the crew soon for dinner.